Hooray! The kids are out of our hair and back in school … or soon will be. But I wonder if the teachers and their aides are “hooraying” as enthusiastically as we are? We expect a lot from our teachers, not least because they have proven themselves as some of the most important people we will ever encounter in our lives. 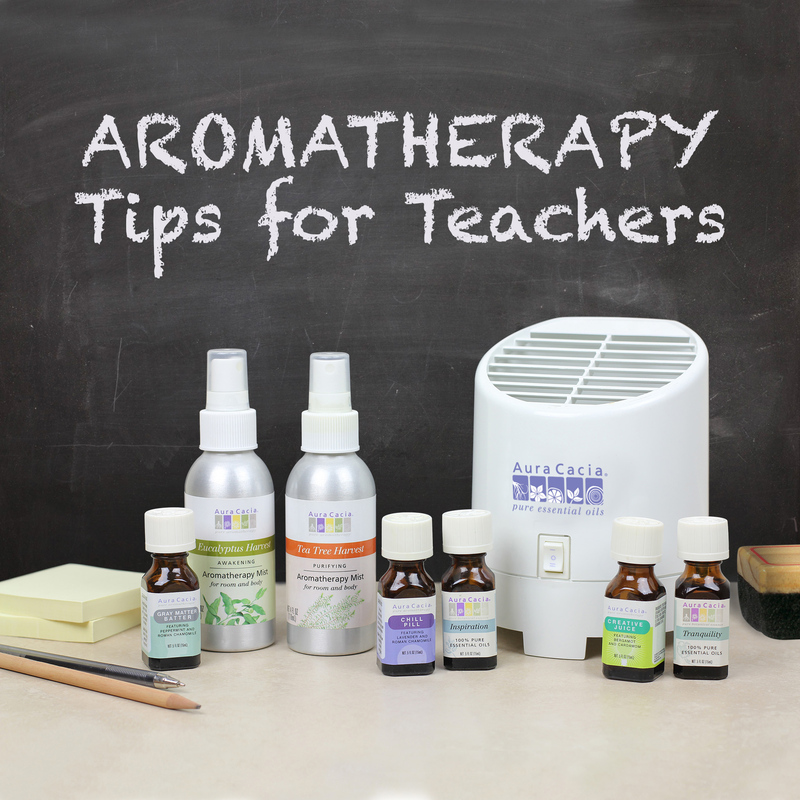 Whether you’re headed back into the classroom yourself or sending a child to school this month, consider making the day more pleasant with these aromatherapy tips for teachers. Diffuse essential oils. Some days, students need inspiration to tackle new learning; others days, a teacher simply needs a moment of quiet! Rather than relying on the overwhelming, artificial scents of fragrance oils, invest in a simple vaporizer that will subtly and deliciously fortify the air of the classroom. To use, simply place a few drops of essential oils on the vaporizer pad. It will quickly become a classroom tool for both learning and teaching. For inspiration: Inspiration occurs in the brain, and our sense of smell is a direct pathway. These products feature essential oils with uplifting, energizing scents that are sure to get young minds firing on all cylinders. Try: Creative Juice Essential Solutions™, Gray Matter Batter Essential Solutions, Inspiration Essential Oil Blend. For focus: Students who are “boisterous” are normal. But when the enthusiasm veers into uncontrolled behaviors or meltdowns, sometimes a sweetly scented, calming and relaxing aromatherapy solution can be a potent supplement to discipline. Try: Chill Pill Essential Solutions, Mellow Mix Essential Solutions, Tranquility Essential Oil Blend. Spray a cleansing mist: It’s a bit unfair to look at kids as mewling germ factories, but the close environment of the classroom sure doesn’t offer the security of a sterile hospital operating theater. Spray the classroom atmosphere with a bit of the purifying reassurance found in an aromatherapy mist. Try: Eucalyptus Harvest Aromatherapy Mist, Tea Tree Harvest Aromatherapy Mist, Tangerine/Grapefruit Aromatherapy Mist. What essential oils have you used in a classroom setting? This entry was posted in Natural health and tagged aromatherapy, Aura Cacia by Cayenne Room. Bookmark the permalink.